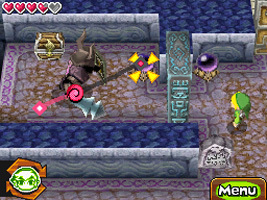 Many years ago, a new Hyrule was founded after a demon named Malladus was sealed away using the Spirit Tracks. Many years have passed, and the tracks have become a railway, with young Hylians seeking to become Royal Engineers. Link receives his diploma from Princess Zelda, qualifying him to drive the trains of Hyrule. However, the Spirit Tracks have started to disappear. Zelda suspects Chancellor Cole, and asks for Link to help uncover his plans. And so starts an adventure on the rails of Hyrule. One of the new weapons Link collects in this game is the Snake Whip, which he can use to grapple across gaps. In an interview in Issue 91 of British videogame magazine GamesTM, the game's developer Eiji Aonuma confirmed that the Snake Whip was inspired by the Rope Snake from Mother 3. In the Hyrule Castle Town shop and in Linebeck III's Trading Shop, you can see a statue of Tingle, a bizarre character from The Legend of Zelda series who doesn't otherwise appear in the game.